As additional data has come in, thru the CHP-STS data collection system, and thanks to Twitter user @erenyanik for sending the data my way early on, I’ve had some time to replicate this analysis for additional cities. Mostly for the sake of presentation, I’ve selected nine cities to look into at first. The first three of these are races between the ruling AKP and the largest secular opposition party CHP: Ankara, Istanbul, and Izmir. The second three are races between the AKP and the second-largest opposition party, the nationalist-conservative MHP: Adana, Manisa, and Mersin. The last three represent races that can be regarded as safe races for the AKP (although with MHP as the runner-up): Gaziantep, Kayseri, and Konya. The choice of these three triplets is to see how the relationship holds up in races where there is substantial competition between AKP and the two opposition parties (CHP and MHP), as well as in races that can be considered relatively safe for the AKP. My reasoning is the following. The explanation for why invalid ballots appear to bias votes towards the AKP could be due to voting irregularities. Without knowing exactly how this would occur, one very simple way would be if there was a system to more intensively declare invalid opposition ballots than AKP ballots. An obvious question mark in the analysis is to what extent any correlation represents systematic mistakes, not systematic fraud. Suppose the AKP has a higher support among the illiterate who are more likely to make mistakes when voting. In this case, we would not be surprised if there was a correlation between invalid ballots and AKP support. An explanation would be that those more likely vote for the AKP are also those more likely to make voting mistakes and have their ballots declared invalid. Given the large difference across districts in the large cities in Ankara and Istanbul, one can easily imagine this as a plausible explanation for the simple unconditional correlations. 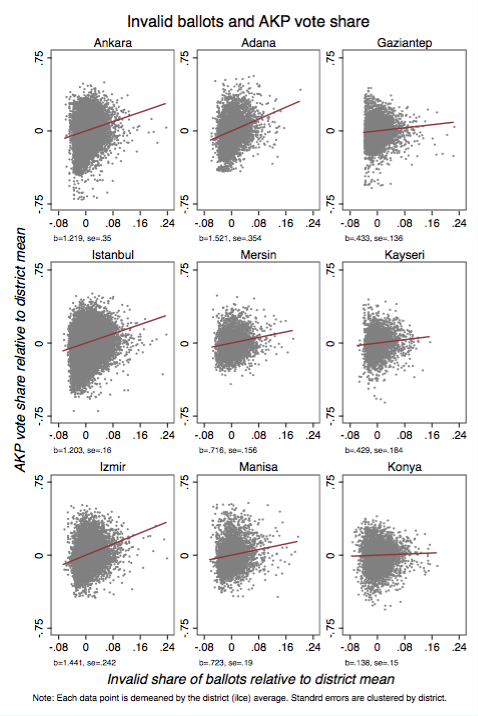 Showing this for both Ankara and Istanbul was illustrating of this, but it would be useful to look at other cities where the correlation between voters’ preferences and socioeconomic characteristics may not necessarily be the same. For example, whereas in the previous two cities, the relatively richer may tend to lean more toward the opposition CHP. But in other cities, like Adana, Mersin, or Manisa, where the opposition party is the MHP, this is not necessarily the case. 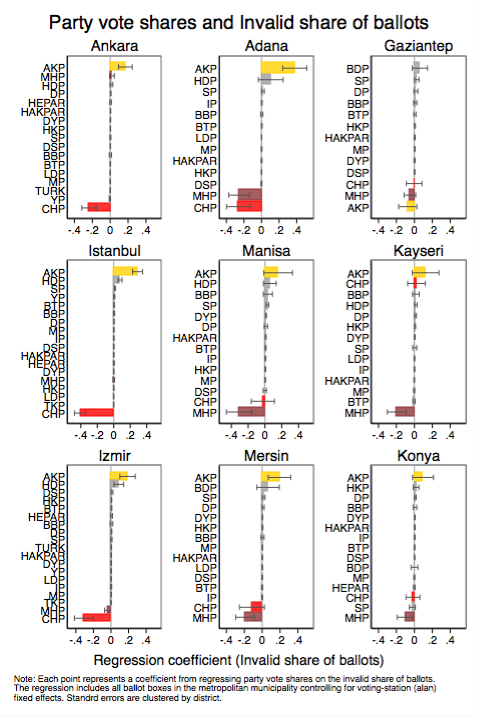 Investigating relationships in cities other than Ankara and Istanbul thus allows a kind of robustness test as the latent correlation between the omitted variables (education, income etc) and the invalid share of ballots, is likely to be different. The figure shows clear positive correlations between AKP’s vote share and the invalid share of ballots particularly for the first two columns. These are also cities where political competition between parties is also relatively high. In the third column, for Gaziantep, Kayseri, and Konya – races that tend to vote for the AKP no matter what – the relationship is significantly weaker. This supports earlier findings and shows it is not specific to Ankara and Istanbul. A more detailed analysis of different parties and using voting station (instead of district) FEs can be done by regressing, for each city, each vote-getting partie’s vote share on the invalid share of ballots controlling for voting station FEs. This figure shows a rather striking and consistent phenomenon. In especially the two first columns where the AKP faces stiff competition from CHP and MHP, invalid ballots appear to bias votes toward the AKP and away from its main competitors. In the safe races, in the third column, the correlations are both smaller and less statistically significant overall (with some exceptions). All together, these last results further supports the hypothesis that Turkey’s most recent elections may have been implemented with substantial irregularities. Until a valid explanation for these results is presented that does not include voter fraud it is difficult to imagine what else could be going on. Stronger than the previous results but still problematic. In Konya and Kayseri where elections were rather symbolic people probably did not bother arguing about votes being valid or not. In other cities, however, it was worth the effort to nullify the vote. Suppose that I got some election data from Sweden. I have no idea about political parties or voting patterns or election procedures in Sweden. I do some regressions (of course with fixed effects) and present the results as evidence of fraud. Nobody would take me seriously because with so little information about the country my findings would be highly questionable. But when researcher is in Sweden and inquires about a developing country nobody question this. In each ballot votes are counted in the presence of representatives of each party. Then a document is signed by them all. Then, official results are posted by ballot on a website. Then, is there a reason to run a regression? Isn’t it better to compare the documents that political parties hold with the results on the website? If there were fraud of the type you describe, wouldn’t the opposition party easily document it? I don’t say that there is no fraud in elections. But, it probably is very subtle and difficult to uncover. A friend of mine, who volunteered as a CHP representative, had to drive between five different voting stations in Sariyer because they didn’t have enough men. What is your estimate of the number of party representatives per ballot box across the country? The ballot box committees are formed at 7:00 AM in the morning. If a member representing a party does not arrive in time, the committee must start work in his absence. A committee can not be formed when less than 4 members are present. A committee has two government employees, one being its chairman. Across the country, AKP does not have the power to assign ~400 thousand government employees who are its sympathizers. Therefore, each ballot box committe MUST HAVE at least one member from the opposing party, either MHP or CHP. Otherwise it cannot function. It is possible that committee members from both CHP and MHP were not present at 7AM. In such a case, the committee chairman may ask voters present near the ballot box to serve in the committee. It may well be the case that AKP had such a superb organization that besides the committee member it had already assigned to the ballot box, it kept two more people ready at each ballot box to take place of the missing MHP and CHP members. But then, we are talking about a party that can mobilize more than half a million people one hour before voting started whereas neither CHP nor MHP could not even send one person to each ballot box. If that was the case, then wouldn’t it be normal to see AKP receiving a much larger share of the votes than either CHP or MHP, without needing to resort to any fraud? Your friend must have been an “observer.” Besides the committee members, the political parties are empowered to have observers at all stations. The observers have certain rights that members of the public does not have. If there are more than 5 observers from the political parties, the committee chairman may select five of them to have a better viewing position. The “Oy ve Ötesi” group had to work with political parties, mainly CHP, to have its people work as party observers. There is simply no way a ballot box committee member can stay away from his/her ballot box for more than half an hour. What a load of FUD. Erik’s been writing about Turkey for years, and quantitative studies like this carry more weight than all the chin-stroking by Turkish pundits. if you find some irregularities in swedish elections, it would be interesting to everyone. at that point, I don’t think anyone can attribute your idea to your misinformation about sweden. same goes here. things are statistically very very strange, not in one, but all the cities dr meyersson analyzed. as tolga yılmaz pointed out, not all the stations were full of reps of all the parties. and here’s a hypothesis: in districts which favor chp, the ballots were ruled invalid if it contained a muhtar ballot, and in districts which favor akp, they were ruled valid. gökhan gümüşdağ, chp candidate of küçükçekmece said that even in that small district, different decisions were given about these ballots in different locations. also, the statistical analysis is not about comparing official data. number of invalid ballots can be same everywhere, but it doesn’t change the fact that they strangely and significantly favor akp. one potential fallback: this analysis disregards the potential dispersion of unobserved heterogeneity across cities. maybe average education characteristics of different parties (hence average invalid voting behavior) get closer as you move along to across different cities. my take is if the competition is between akp and not chp and there is not much consolidation of votes via chp and mhp then we wont see significant coefficients on your regression. for instance in manisa there was a stiff competition but the coefficients are not significant, and against your argument in izmir there wasnt a stiff competition but the coefficients are significant. to move away from these concerns I would suggest you to take a look at the eastern towns where the competition is between akp and bdp. supposedly the unobserved characteristics of bdp and akp voter are closer to each other than a chp voter. and it is quite possible that in east an average akp voter has a lower likelihood of having an invalid vote. plus even within your sample an average bdp/hdp voter have positive correlation with invalid vote share (though not significant). if you still find a positive correlation between invalid vote share and akp vote share then you have a very strong base. start with Diyarbakir, Van and Mardin. then move with Agri which stands a very good example. the competition was stiff, many rumours of misbehavior (the election will actually be renewed) and the race was between akp and bdp. Erik, great work and great articles on the issue. It’s for sure many international readers had a chance to get a glimpse of what’s going on regarding the elections in Turkey with your explanations. However, as a person working in data visualization I have some concerns about the datasets we are currently looking at. That’s why I personally decided to wait until the official results are announced by YSK. I am not sure whether they’ll do that but I really hope that they will. I am not sure whether you speak Turkish or not but if you do please read this article: http://blog.olgusal.org/post/81834608021/sand-g-n-ici There are some concerns about the data integrity and accuracy. Any analysis based on current STS datasets might be misleading. If you can’t read it I’d try my best to summarize the problems here. I might have an idea how the number of invalid ballots favor akp. actually, it’s not my idea but suggested by two chp candidates (gökhan gümüşdağ of küçükçekmece-istanbul and mustafa apaydın of antalya, both lost with very small margins): the voters were given two envelopes: one (blue) for the mayor and local council, and one (white) for the ‘muhtar’ (‘demarch’?). according to the claims, in some districts, the vote for the mayor and council were decided invalid if the muhtar ballot turned out to be in the blue envelope; and in some it was accepted as valid. if the claim is true and if this difference depended upon the voting behaviour of the district, this might very well count for most of the discrepancies. I believe that an overall explanation is much more probable than thousands of election officers committing fraud. also, I’d appreciate if you can replicate the analysis for antalya. the race there was as competitive as ankara, and it’s also a very critical city. Another very crucial piece of information is the quantitative information in regards to the “presence/absence of CHP and/or MHP members in the `voting station boards (sandik kurulu)`”. What fraction of the voting stations lack opposition party members? Did CHP actually have at least one member present at each and every voting station when the ballots were counted? Have the opposition party officials kept an `attendance sheet` of the party members assigned to the voting stations? At which stage of the ballot count AKP might have intervened to invalidate the ballots cast for CHP or MHP? At the voting stations? Or at the district election stations (Ilce Secim Kurulu)? Or has the electronic system been hacked to invalidate some of the opposition votes? Obviously, we need more data to get to the bottom of this problem. Lastly, thanks very much to Erik for his stimulating work. (11) The number of empty envelopes which contained no ballots at all. (12) The number of envelopes [that contained some ballots for other elections, that is, county mayor and/or county council] that did not have a ballot for the mayor election for the metropolitan area. (13) The number of ballots that were counted as invalid. (14) The number of ballots that were not taken into consideration. (4) If you place the “Yes” seal on more than one candidate, if you mark your ballot in any other way (such as writing “thief” under the name of the ruling party’s candidate, or “impotent” under another candidate’s name), your ballot will be counted as invalid (as in entry no (13) above). (5) Any other way that will take your ballot out of consideration.For details on this one, I need to check the Higher Election Council’s memos. (c) Those that are declared or made invalid as part of a systematic election fraud. Yakup Ozsoy commented above that in Konya and Kayseri, where AKP won the election by a landslide, “people probably did not bother arguing about votes being valid or not. In other cities, however, it was worth the effort to nullify the vote.” His comment concerns the process of counting ballots after the closing of the ballot boxes. How about people not bothering to vote at all, or to cast an invalid vote? In Konya, AKP received close to 70% of all votes in 2011. If someone, who could well have cast an invalid vote if he/she lived in Ankara or Istanbul, would he be more likely to do so in Konya, or would he be inclined to vote for an opposition party? On the other hand, we know that Ankara, Istanbul and Izmir were all scenes of energetic protests during the Gezi events in June 2013. The Gezi protests were not simply protests organized by CHP, MHP or other political parties. True, they were mostly directed against the ruling party and its leader, Erdogan, but there was some criticism directed against the opposition parties as well. In Ankara, an MP from CHP, Aylin Nazliaka, ran a campaign to become CHP’s mayoral candidate for Ankara. Certainly, Gezi protesters did not embrace Mansur Yavas, the former MHP candidate, and Mustafa Sarigul, famous for his corruption, in Ankara and Istanbul, respectively. Thus, it is quite possible that many Gezi protesters in these three largest Turkish cities, who were not satisfied with the opposition parties’ mayoral candidates, decided to cast their votes as invalid. Furthermore, as I point out in my blog post, some ballot result reports mistakenly included the number of unused ballots under column no. (14) above. An unused ballot cannot be an invalid ballot, because an invalid ballot is by definition a ballot that has been cast by someone and placed into the ballot box. This is a misunderstanding due to the legal language of the report that was apparently missed by some of the ballot box committee members. Hence, the data that Erik Meyersson uses contains figures for some ballot boxes that simply does not correspond to the reality. I don’t know what percentage of the ballot boxes exhibit this problem, neither do I know how they are distributed across localities. But what is certain is that they obfuscate Meyersson’s conclusions.